The statement of Mr. Kamau is neatly summed up in the “Daily Nation.” In conclusion, Mr Kamau wrote that the new administration should be given a chance without the “yoke and burden of the past fettering their action.” Thus, the envoy is asking straight-forwardly from the international community to stand up for impunity. It has to be remembered that these two individuals were allegedly involved in the 2007/2008 post-election violence that led to the killing of more than 1,000 individuals and the displacement of some 650,000 people. Forgetting the past, whether or not these two individuals were involved, is not an option. Is the statement just a gaffe? In the meantime, Attorney General Githu Muigai and Mr. Ruto himself disassociated themselves from the letter of Kenya’s UN envoy. However, the office of the president remained silent until today. Although Mr. Kamau has always been critical to the ICC proceedings due to orders of the outgoing administration, such strong wording used by this experienced diplomat comes as a surprise. In short, such a statement questions Kenya’s reputation in international circles as a reliable partner. Mr. Kamau’s gaffe is already a debacle for Kenya’s foreign diplomacy that will take quite some effort to refurbish it. One can only hope that Amina Mohamed will become Kenya’s new foreign minister and she will take care of the mess. 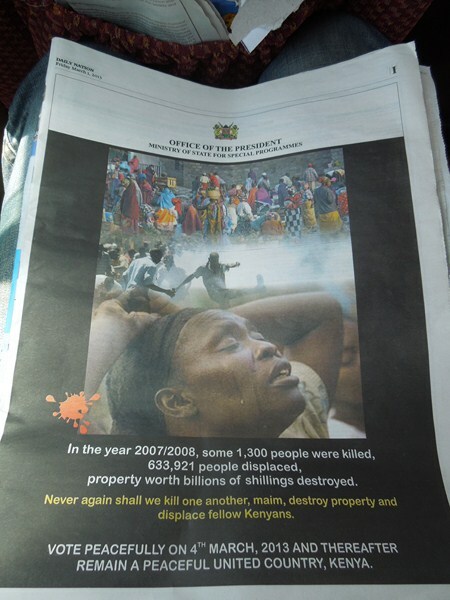 A stark reminder in the Daily Nation of the 2007/2008 post-election violence. As some comments in Kenyan papers pointed out, the statement of Mr. Kamau is “outrageous” and “nonsense.” Indeed, I cannot help myself thinking it is ludicrous of what Kenya’s UN Envoy issued in his statement. The claim that ICC’s action would lead to violence is an outright threat that is, to say the least, very untypical in diplomatic circles. Arguing that the case poses a threat to the wider region can hardly be understood either. It is important to remember that the Kenyan government could have established a domestic tribunal but was not able to agree upon on an option that was acceptable for the different sides at the time, the Party of National Unity (PNU) and the Orange Democratic Movement (ODM). The issue came up as the independent “Waki Commission” published a report in 2008 about the post-election violence and recommended to set up a special tribunal with the mandate to prosecute crimes committed during the post-election violence in order to overcome the chronic impunity in the country. Also, an envelope was handed over to Kofi Annan, who negotiated the agreement between PNU and ODM representatives to end the chaos, including a list of names that were considered to be the alleged perpetrators. Justice Philip Waki was not granted enough time to find evidence of all the cruelties committed during the post-election violence. As Mr. Waki points out and as it is clear when you read the report, the process was rushed. However, the commission surely tried to find objective evidence. In 2009, Mr. Annan handed over the envelope of Mr. Waki to the ICC prosecutor Luis Moreno-Ocampo. In the same year, the Office of the ICC Prosecutor used its powers to initiate an investigation on its own initiative, the first time an ICC investigation was launched without a referral. And this “unilateral” action is under fire by those in Kenya who oppose the interference of The Hague. As Kenya did not come up with a tribunal on its own, the ICC took over the matter. A lot of Kenyans at the time perceived that a domestic solution would not have brought any justice. It was a time where the new constitution was still under debate. That is also why 70% of Kenyans supported the ICC and the decision that an international court is handling the subjects. Also the Kenyan government promised to comply with the outcome of the ICC, although such cooperation has been limited from the start and all too often domestic claims of a “colonial and imperial” ICC were nourished in statements to the Kenyan public. The worst part certainly played the Western representations in Kenya. The British High Commissioner, the U.S. Ambassador and the representative of the EU declared in various ways that they would not have contact with people indicted by the ICC and that if Kenyans would chose Kenyatta and his running mate that it would have consequences. It hardly can come to a surprise that the Kenyan public at large did not appreciate such comments. For sure, the Western powers tried to push for a pro-human rights approach. At the same it can be safely declared a failure on all levels as Kenyans were suddenly more inclined to vote for Mr. Kenyatta and Mr. Ruto’s Jubilee Alliance as the Western powers were seen as interfering in domestic matters. 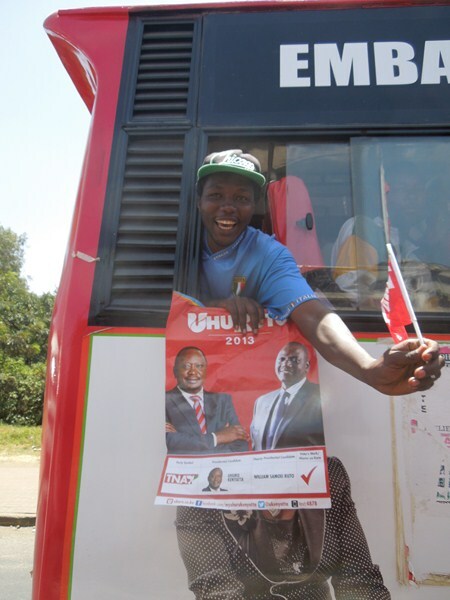 A Jubilee supporter in Nairobi on the way to the last rally before the elections. It is important to mention that the ethnic background had an influence of the perception on partiality of the ICC. As three Kalenjin and two Kikuyu were among the “Ocampo Six,” while no Luo was accused, the ICC was seen as taking sides in Kenya’s difficult ethnic system. Many people also told me personally that the outgoing president Mwai Kibaki and Raila Odinga should also be in The Hague because both of them if not incited at least did not stop the violence of their supporters. Yet, both were saved by the ICC because otherwise the fragile unity government that was formed might have fallen apart and the international community tried to prevent it. Therefore, what justice is it when some are taken to court while some others are left out? In order to know who was actually on the original list of Justice Waki, his list in the envelope would need to be published. The claim of ethnic partiality by the ICC is by all means absurd. However, it is the belief by quite a lot of people in Kenya, particularly among the Kalenjin and Kikuyu, that the court is an instrument of neo-colonialism interfering in sovereign affairs. Therefore, the public opinion among part of the Kenyan public turned to their favor. In fact, the ICC suspects were able to use the ICC as a tool to win the elections. I would go so far to argue that the ICC warrant catapulted Mr Kenyatta into Kenya’s presidency. Of course, it was mainly the economy that informed the choice of Kenyans more than anything else (besides the ethnic belonging). And yet, “Uhuruto” reached the gut feeling of many proud Kenyans. Hence, it was not a surprise that Mr. Kenyatta and Mr. Ruto created the Jubilee Alliance in 2012. They joined hands on the ground of being threatened by the “imperialist West.” Thus, two leaders of communities that were clashing during the 2007/8 violence were suddenly united under one umbrella. In a smart move, the two running mates suddenly talked about “reconciliation” for the whole country, because suddenly there was friendship instead of enmity between Kikuyu and Kalenjin. However, that is clearly neglecting that neither any justice nor any substantial dialogue took place. The structural issues that determine ethnic hatred remain and as soon as the Jubilee Alliance is going to fall apart (and this will much likely happen looking to the performance of any alliance so far ever since multiparty democracy was re-introduced in 1992), the ethnic differences will come up again and tension between the two communities will resurface. 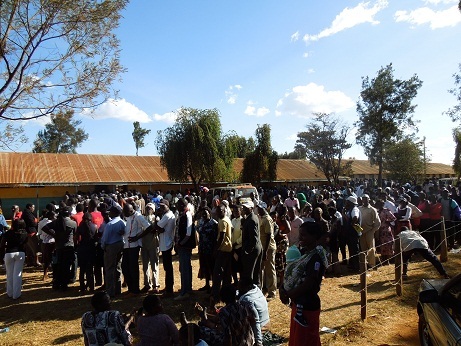 As I have experienced myself as an election observer in Uasin Gishu county in the North Rift Valley that during the 2013 general election there were claims of Kikuyu voters that they were supposedly not allowed to vote while all the Kalenjin were granted the right to do so. While it was later on solved, suspicion between the ethnic communities remained. Uhuru Kenyatta and William Ruto, were successful to present themselves as victims that were hunted down by the West. Nevermind that it is an African judge, Fatou Bensouda, who is heading the Court in the meantime; many Kenyans perceive the ICC as an institution that is putting Africa(ns) on trial. Such criticism neglects, of course, the unfortunate fact that most human rights violations related to violent conflict just happened on the African continent during the past ten years or so when the ICC started to operate. And more importantly, the ICC is not out there to put Africa on trial but to finally bring impunity to an end and bring justice to those that had to go through so much suffering. Despite fears of violence, Kenyans remained largely peaceful and showed enormous determination to cast their vote. My own experience in Eldoret in the Northern Rift Valley for one week around the 2013 general elections taught me that there is a lot of suspicion toward the West. A strong sense of foreign interference was among the people and any argument against the already established belief system would rather comply with the assumption that any mzungu is against their leaders, not allowing any real or balanced discussion. And yet it is true that there seems to be a certain bias in the U.S. and in Europe towards Raila Odinga – and certainly it is perceived that way by the huge majority of Kikuyu and Kalenjin. A future way out of the current situation could be a resolution passed on 26 April 2013 by the East African Legislative Assembly urging the East African Council (EAC) Council of Ministers to ask the ICC to transfer the cases to the East African Court of Justice (EACJ). Since 2005, there is a draft protocol waiting to be signed by the EAC members that would give the court competency in human rights (see part C). However, it is everything else than an easy task ahead as Lady Justice S. B. Bossa argued in a presentation. In June 2012, the Council of Ministers of the EAC made clear that the court should also deal with crimes against humanity. The idea floated around that after the International Criminal Tribunal for Rwanda (ICTR) finished its job in Arusha earlier this year that the facilities could be used for the cases so that the process is more regionally owned. In June 2012, Mr. Kenyatta’s lawyers requested the ICC presidency to shift the trial to Arusha but the ICC rejected the request. While the EACJ is not an option for the “Hague Four,” the upgrading of this regional court will certainly help to avoid the perception of a Western imperialist institutions acting against Africans while it is in reality a fight against impunity. Another option is the African Court on Human and People’s Rights which actions could be enlarged in the future. Thus, it will much depend on the action of the African Union that the impunity of human rights violations on the continent is going to stop as two fellows of Human Rights Watch (HRW) argued in “The East African.”A trial in Africa will be much harder to exploit by politicians who are accused of human rights violations. Most likely, the new president of Kenya together with his vice-president will try to have a moderate approach with the rest of the world instead of the harsh statements delivered by UN Envoy Mr. Kamau. It is too important for the new leadership to remain on good economic terms with the West as they try to avoid any isolation that might go as far as sanctions or the withdrawal of development money. However, Kenya is also considered an important partner by the West, as British prime minister David Cameroon shook hands with Mr. Kenyatta at the Somalia Conference in London the other week. Before the elections there was still speculation whether the UK would break off relations with Kenya. Mr. Cameroon argued that Mr. Kenyatta is cooperating with the court and therefore it is alright to welcome him in London. And the two running mates have promised during their campaign several times, they will follow the procedures of the court. As key witnesses have withdrawn or disappeared (there is a likelihood that they were murdered), the ICC prosecutor faces a very challenging situation in Kenya as she accuses the government that it does not comply appropriately. Most likely the case against Mr. Kenyatta and Mr. Ruto is going to collapse as it already has been delayed several times. In this light, it is even more surprising that the UN Envoy issued such a statement. It might be related to the fact that the installment of ministers is still stalled and there is no proper leadership at the moment in the foreign ministry. In sum, I can only hope that the largely peaceful 2013 elections can guarantee the take-off for the country that everybody hopes for. At the same time, the country finally has to deal for real with its past and address the historic injustices up to recent times. For both, Mr. Kenyatta and Mr. Ruto the best way forward must include measures to face the truth and allow critical questions. Both individuals have quite a tarnished past, therefore the likelihood of such a measure seems to be hardly possible. And yet, it would be the forward that peace is truly to arrive in Kenya and is not just pledged on election day in a somewhat artificial manner. It is true that also the economy has to further take off so that more people are lifted out of poverty. However, the inequality might become even bigger and the ethnic card will be easily played out that can bring the country back to chaos. Thus, reconciliation is necessary in Kenya. Without a doubt, it will take time. My personal wish would be, as naïve as it may be, that the new Kenyan government will deal critically with its past. That will also allow a much more relaxed approach with the ICC. And for the Western powers, one can only strongly recommend to learn from its failures during the campaign period of what should not be done before elections. Instead of impunity, an internal approach linked with regional mechanisms should be in place.